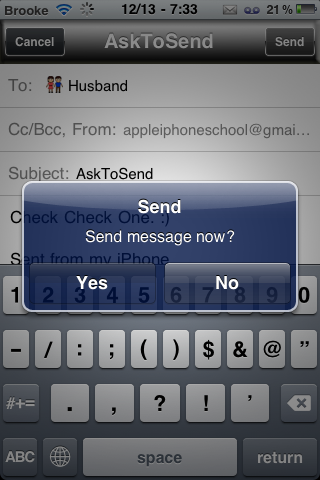 AskToSend is a little hack that adds a pop-up message when sending SMS and email messages confirming that you would like to send the message. A simple little hack that requires a confirmation every time a message is sent. The pop-up allows you to choose Send or Cancel. Selecting Cancel will bring you back to the message you were about to send. When installed, this app does not add an icon to your SpringBoard but it does add a few settings into the Settings application. In the settings you can choose to turn on/off the confirmation pop-up for Messages or Mail. It also allows you to turn on a “Confirm no subject” setting for Mail. When I tested the app… it worked exactly like I expected it to. Personally, I’m not sure I would want to confirm my messages every single time I sent one but… it might be just what you are looking for! You can get AskToSend via the BigBoss source.